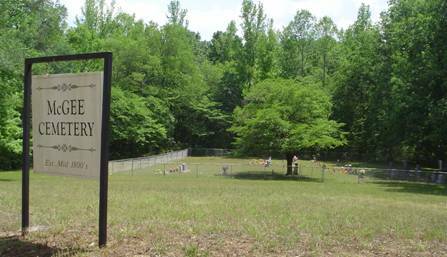 The McGee Cemetery is located off the Natchez Trace Parkway a short distance from the Lower Glenrock rest area. At the crossroads just south of Lower Glenrock, go west on Upper Factory Creek Road approximately 200 to 250 feet and turn left onto a gravel road. Go 1.1 miles to the cemetery on the left. The burial ground has a chain link fence enclosure. There are about four unknowns in this cemetery. Two of those appear to have the base for a headstone but none were found. This cemetery was established in the mid 1800’s. Griggs, Ford; b. 01 Jun 1927, d. 11 Jan 2013, son of James G. & Virginia C.
Griggs, Ila; b. 09 May 1900, d. 07 Nov 1900, daughter of J. W. & M.C. Griggs, infant; b. 13 Jan 1908, d. 19 Jan 1908, infant daughter of J.W. & M.C. Griggs, Walter; b. 20 Sep 1902, d. 27 Jun 1903, son of J.W. & M.C. Griggs, Willodean C.; b. 01 Jan 1919, d. 13 Sep 1975, wife of Forrest C.
Long, Price; b. 27 Feb 1900, d. 30 Jan 1902, son of M.W. & M.E. Ray, M. C.; b. 08 Mar 1856, d. 29 Dec 1917, wife of W.A. The following names were included in the original enumeration but no markers were found by this enumerator.